Although today started out very slowly at the station, due to heavy rain, the afternoon sun came out and brought with it some movement in the skies. I decided to take a walk in the sun, and borrowed another ringers binoculars (mine are in for repair). I must also add that the binoculars I borrowed are the Aston Martin of the market, while mine might come is as a nice BMW, so lets say, the difference is obvious! I wandered along the sandy beach close to the bird station and took up residence on a small hill in the dues to enjoy the sunshine and keep an eye on the sky. 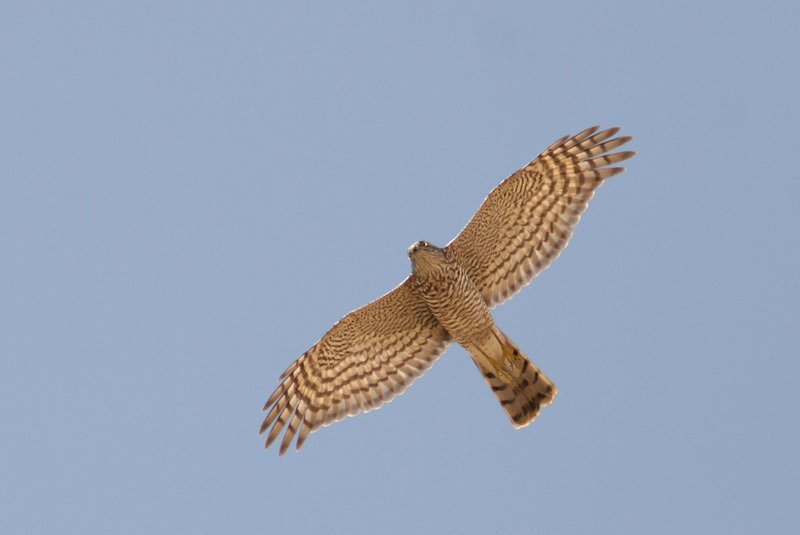 At first I became aware of the large numbers of sparrow hawk (Accipiter nisus) in the sky. They are a very common sight here at Falsterbo, and today alone 133 were reported to have migrated (i.e. headed south) and over the last week an average of 250-300 were reported migrating daily, and since the start of August, there have been 9,426 individuals migrating from Falsterbo! So on a normal day – they aren’t too difficult to spot! I made myself comfortable on the sandy hill and kept my focus on the sky. The air temperature was warming up rapidly after the cool wet morning and the raptors were taking full advantage of the warm thermals. Soon I spotted a small group of buzzards (Buteo buteo) (or honey buzzards, I can’t be sure) that were flying in circles and gaining height almost directly above my head. Among them was a larger bird, very pale in colour. I quickly checked the bird book and my heart began to beat a little faster as I enjoyed my first view of an osprey (Pandion haliaetus). Among the buzzards and sparrow hawks in the sky it looked really large and impressive. It soared gracefully and hitched a ride on the warm air, that carried it out over the water. It was a pleasure to experience, especially through some high quality binoculars. 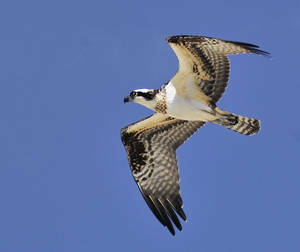 Over the last week there were on average five osprey reported migrating each day, with a total of 279 since the first of August. At this point I was literally lying on the ground, watching the sky, to ease the neck cramp I was getting. Bird watching is not easy I tell you, especially when the birds are very high in the sky! After some time, I decided to make my way back along the sand dunes to return the binoculars to their rightful owner. I have realised that coming to this mecca for birders, without a pair of bins, was not my best idea yet. I am here for another 3 weeks, and I am seriously considering buying another pair, to make my time here that little more valuable. As I wandered along the dunes, I turned my attention to another group of flying creatures, butterflies. At the moment there is a couple from the UK staying at the bird station and they are keen butterfly and month enthusiasts. 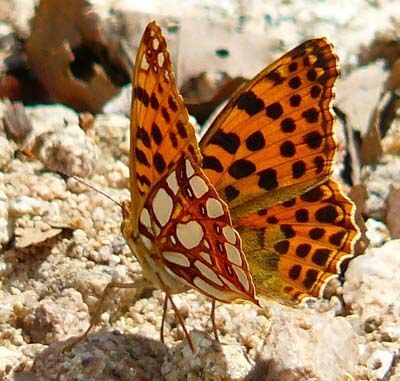 The male half of the couple recently spotted a Queen of Spain Fritillary (Issoria lathonia) in the garden outside the station and showed me some pictures. As I wandered along the sand dunes, I met several of the species enjoying the newly emerged sunshine. A very beautiful butterfly! After arriving back at the station, filled with my new experiences I joined the other ringers on a quest to capture and colour ring some Stonechat (Saxicola rubicola) breeding on the island. 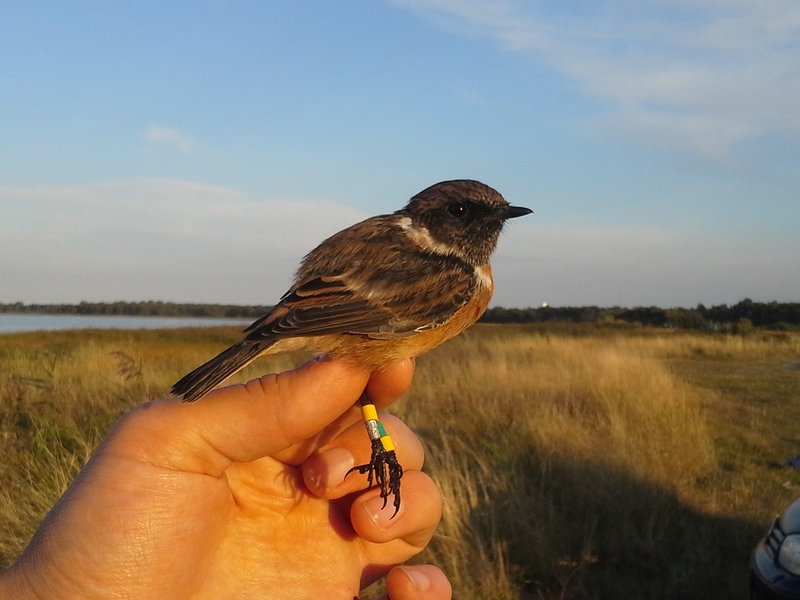 Stonechat are not common breeders in Sweden, and this pair has attracted some interest. We went out to a site on the coast, near some reedbeds and set up some nets. It was a long wait, but after some encouraging with managed to catch one of the two birds we spotted. It was an adult male that had been ringed two years earlier. We had been hoping to catch an un-ringed juvenile bird, but maybe another day. Not a bad end to the day!